You'll be charmed by this transitional-style shelving unit, part of the Little Smileys collection, that features large open storage spaces and a rich Gray Oak finish. 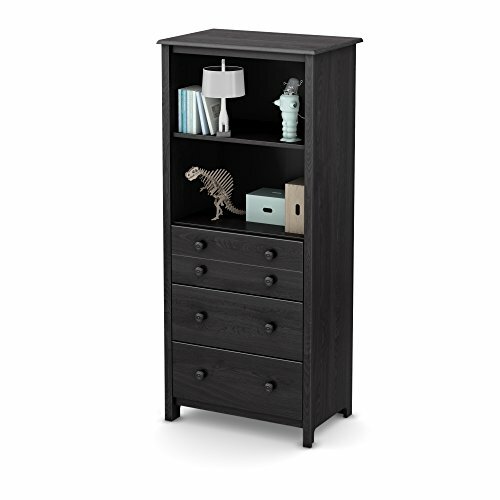 Its narrow fit and three large drawers make it entirely practical, and the recessed sides, grooved top drawer and wooden knobs will add a stylish touch to baby's room. Decorative groove on the upper drawer and recessed sides which enhance its transitional style. Gray Oak wooden knobs. Tall and narrow - ideal for a small room. Features 2 large, open storage spaces defined by an adjustable shelf that can support a weight up to 15 Pound - ideal for holding large items. Features 3 practical drawers. Metal slides for smooth gliding. . Drawer #1 dimensions:20,75" (L) x 13,75" (D) x 5,25" (H) . Shelf #1 dimensions: 22,75" (L) x 17" (D). Safety is an integrated part of our values: this product meets or exceeds all North American safety standards. Accessories not included. Requires complete assembly by 2 adults (tools not included). Product dimensions: 26,5" (L) x 17" (D) x 60" (H). Box #1 dimensions: 65,75" (L) x 18" (D) x 4,75" (H), 95 Pound The box for this item is heavy, so be sure to have a friend with you - or good biceps. - when it arrives. This product's packaging has been tested and is certified to reduce the risk of damage during shipment. Made in Canada with non-toxic laminated particleboard. Clean with a soft dry cloth. 5-year quality guarantee. Any product-related questions? Contact the manufacturer's customer service, available 7/7 by phone, chat, and email. Consult their website for details.